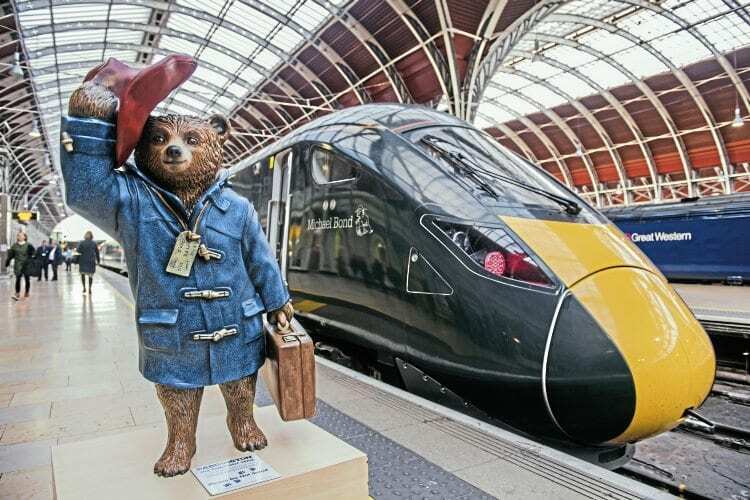 CREATOR and author of the Paddington Bear books Michael Bond has had a new GWR Class 800 IET named after him. The names Paddington Bear/Michael Bond were unveiled at each end of set No. 800010 by his daughter Karen Jankel at a ceremony at Paddington on January 10 that was also attended by Mr Bond’s widow, Sue. GWR event at London Paddington with IET 800010 ‘Michael Bond’ ‘Paddington Bear’ in platform 1 at London Paddington Station. Mr Bond died aged 91 last June and the naming event was three days before what would have been his 92nd birthday. The famous bear dates from 1956 when Mr Bond saw a small bear alone on a shelf in a department store near Paddington station.